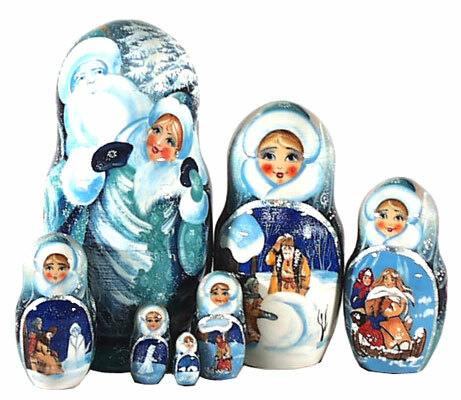 There are 7 figures of similar Russian Nesting Dolls - Fairytale Snow Maiden in the nest. 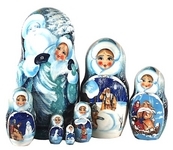 On every doll sceneries from the popular Russian Folk Fairy Tale "Snow Maiden" are depicted. Once upon a time there lived an old man and woman. They had a good life, but had always regretted that they didn't have any children. One lovely winter day the couple saw some neighborhood children playing in the snow, and the disappointment of not having a child of their own hurt more than ever. The old man turned to his wife and said "Let's go outside and build a snowgirl - it will be like the daughter we never had." So the two built a snowgirl, carefully forming her hands and feet, her cute little nose, her mouth, her chin... Seconds after they finished, the snowgirl's lips suddenly turned red and her eyes began to open. She smiled warmly at the old couple, shook the flakes off her body, and emerged from the snowdrift as a pretty young girl! The old couple was overjoyed, took her into their hut, and named her the Snow Maiden. The Snow Maiden grew quickly, not by the day but by the hour. Before long, she became quite beautiful and the old couple doted on her. The Snow Maiden was a dream child. She always did her chores, never complained, and was very affectionate. When she sang a melody, it were as if an angel from heaven were singing just for them. The Snow Maiden spent much time outdoors. She liked the feel of the cool breeze on her fair skin and enjoyed spending time with the small creatures of the forest. But winter soon passed and the warm sun of spring started to heat the land. The girl now became quite depressed. "What's the matter," the old couple would ask. "Are you not feeling well?" "No, Mother, no Father, I'm fine," she would reply. But there was no denying that something was wrong. As the last snow melted, as flowers began to grow in the meadows, as the larks started to sing, the girl became even sadder. And she would hide from the sun at every opportunity. Once dark clouds moved through, bringing with them a flurry of hail. The girl rejoiced, looking at the stones of hail as if they were giant pearls. But soon the hail melted and the girl cried. Summer arrived and one day a group of girls called out to the Snow Maiden, "Come with us for a walk in the woods!" The Snow Maiden didn't want to go, but her parents urged her, saying, "Go play with them, dear. You'll have fun." So she went with the girls, who began collecting flowers, singing songs, and dancing. The Snow Maiden didn't join in, though, and wasn't having a very good time. Then it began to get dark, and the other girls made a fire from some twigs they had collected. They continued to laugh and sing, and the Snow Maiden could see how much fun the girls were having. Finally, she decided to join in. For the first time since winter a smile formed on her face as she laughed, sang, and danced with the others. Then, one by one, the other girls began playfully jumping over the small fire they had built. The Snow Maiden jumped over when it was her turn, but halfway through her leap, she suddenly melted and turned into a white cloud. A faint good-bye was heard before the cloud rose up and disappeared into the heavens. Very rich and bright paints including silver are used. Beautiful sparkles make illusion of snow twinkling. All the drawings of this item are made by the real artist so delicate and subtle, that as a whole the doll is just breathtaking! The tallest one is 10", the smallest - 3/4".